Martinez-Neal brings her gentle story to life through beautiful graphite and colored pencil artwork, set against cream-colored backgrounds. Soft blue and red details pop against the charcoal scenes, which perfectly reflect the snapshots of Alma’s family. While Alma feels enriched by learning her family’s history, she is also empowered by the knowledge that she will give her name, Alma, its own story. Martinez-Neal’s first outing as author is a winner—her velvety and largely monochromatic pencil drawings, punctuated with cherry red, teem with emotional intimacy. It’s an origin story that envelops readers like a hug. The softly colored images and curvilinear shapes that embrace the figures evoke a sense of warmth and affection. At the story’s end, the only tale readers have not heard is Alma’s. “You will make your own story,” states her father. A beautifully illustrated, tender story to be shared with all children, sure to evoke conversations about their names. Mostly monochromatic against a cream background, the illustrations—print transfers with graphite and colored pencils—are delightful, capturing the distinctive essences of Alma’s many namesakes...A celebration of identity, family and belonging. Throughout, grayscale print transfer illustrations have a soft visual texture, and subtle colored-pencil highlights in pinks and blues enliven each spread. The pictures end up stealing the show in their depiction of the sweet closeness between Alma and her father. They also convey a subtle, supernatural connection between Alma and her ancestors, whose images in the family photos make eye contact with her outside of her father’s awareness. As artist, her mostly black-and-white graphite and colored pencil drawings with splashes of red (suggesting now) and blue (capturing then) provide an additional, enhancing narrative: the family's Peruvian roots, Alma's avian and floral interests, her bilingual drawings, her historically inspired style sense, even a peek at Esperanza's worldly treasures...Names are so much more than a collection of letters and sounds, Martinez-Neal reminds. The book's final words, "What story would you like to tell?" become an invitation for readers to share and claim each of their own, distinctive stories, histories and identities. 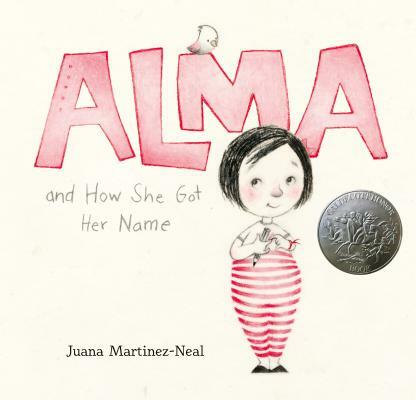 Every piece of Alma’s name, she discovers, comes to her from someone in her family, and, as she and her father talk, Alma feels a new sense of connection...Touching on cultural themes central to the recent Pixar movie “Coco,” this is a tender outing for children ages 4-8. A great book for introducing family history and the importance of our place within it.